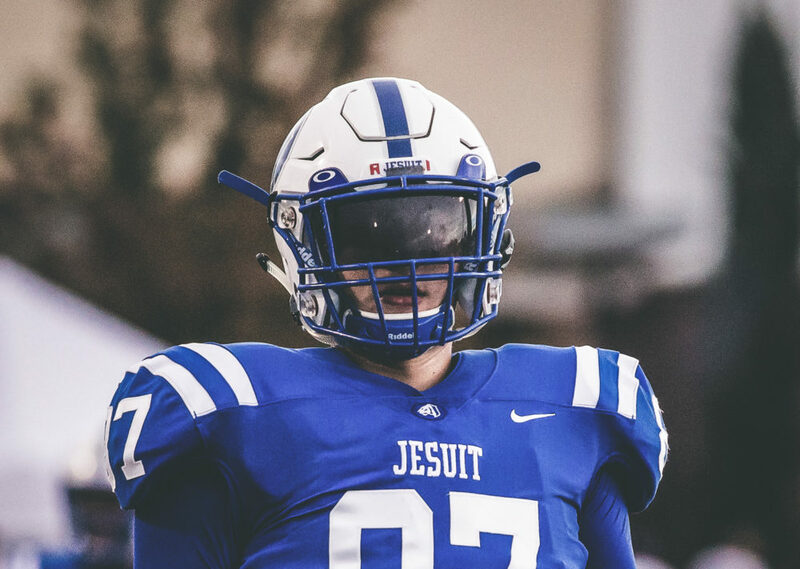 “He’s a unique big guy that is athletic enough to go down the field and use his hands as well- a gem for any team.” ~ Head Coach Matt Thompson, Jesuit Tigers. 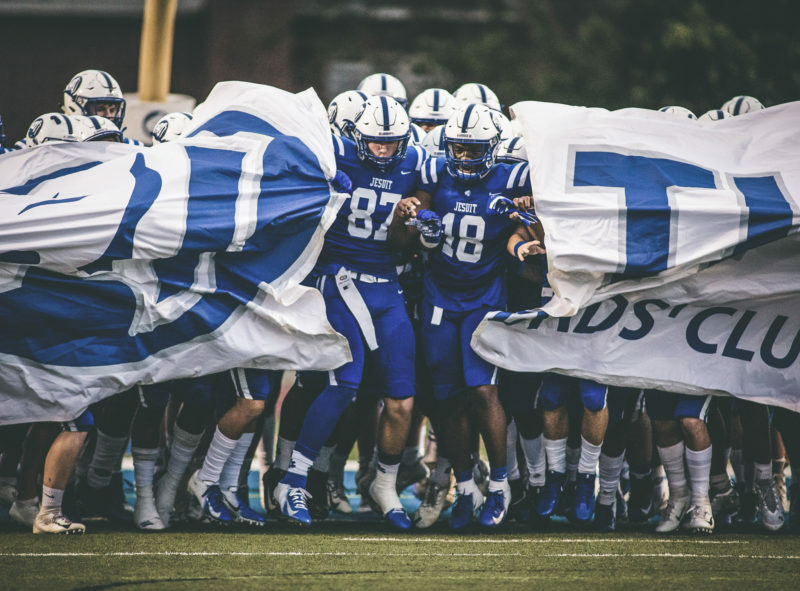 Tampa, October 4, 2018– The royal blue and white Jesuit Tigers are undefeated at 5-0 and 2-0 in districts with wealthy 76-man roster depth as a private boy’s high school. They also possess the ultimate element of surprise under their sleeve, student athlete and tight end, Jonathan Odom. He’s a tall task to line up against, literally, and a sought-after prospect that can mold into a variety of collegiate offensive schemes. Here’s a BCP inside look at why this junior is an absolute problem for 5A defenses around the county. 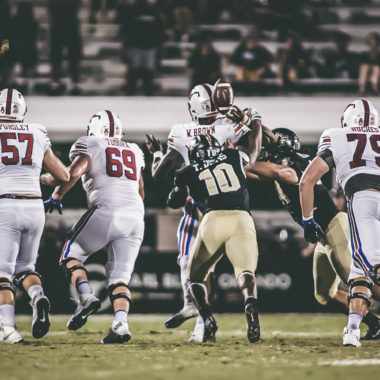 “Odom is just like any other big guy trying to grow into his big body; a physical blocker, runs his routes precisely and opens himself up in passing game when eyes are on the receivers. 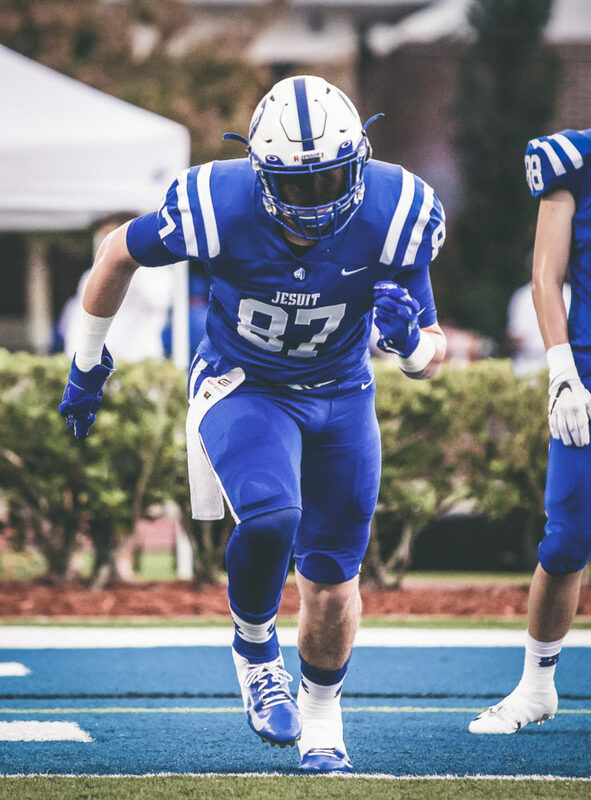 We run two or three tight ends sometimes in our schemes, and recently he had a stress sprain in his foot so he was a little disgruntled in the recruiting process, but picked up more attention now coming back strong and he just got Vanderbilt to pull the trigger for his first offer,” Head Coach Matt Thompson explains passionately. Jonathan TOWERS over his mismatches, mossing defenders with his dominant 6’5” 235-pound next level frame like it’s nobody’s business. You better believe he can lay down the law with some ferocious blocks too, paving paths and throwing guys around like rag-dolls! Not to mention his smooth agility and field awareness are second to none for a big fella, pursuing his assignments on the gridiron seamlessly. Head on a swivel when entering Odom’s side of the domain, or you might end up with a mouthful of grass. “We’re a run-oriented offense, but Jonathan and senior Larry Hodges both on the field at tight end complement each other nicely. He’s really coming along from last year to now as a junior, running and training harder. He’s becoming more of a leader, looking to him to make plays now- something that comes with age and time, and he’s excited about the game and development. Odom knows when he makes mistakes, I tell him less and less and has a greater understanding within the offense,” Head Coach Thompson states. Odom is strategically clever with his mitts, assuming his role last year as a sophomore in 7 games with 180 receiving yards on 10 catches, with 2 pancake blocks and a pair of receiving scores as well. 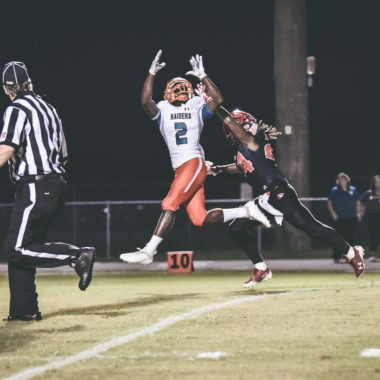 This 2018 season he’s racked up 99 yards on just 6 receptions, on track to double last season’s total, contributing 5 TD’s on the year so far (without counting last week’s matchup stats not listed on Maxpreps). Coach Thompson goes on to preach, “He’s tailor made for Vanderbilt’s offensive schemes, a unique big guy that is athletic enough to go down the field and use his hands- a gem for any team. Once one SEC team has a look, they tend to fall in like dominoes. Jonathan and the Jesuit boys’ scorched Spoto last week with a final score of 59-0 in an away conference game at Riverview. This Friday night light’s matchup is a more significant one for the Tigers, taking on Osceola with their rowdy home crowd.